LIVING IN DUBAI AND WORKING IN ABU DHABI IS LIKE LIVING IN SAN DIEGO AND WORKING IN LOS ANGELES IS CHALLENGING. UNTIL NOW. Hyperloop is a new mode of transportation that is able to move people and freight quickly, safely and on-demand. Its speed can reach up to 1,200 km/h (746 Mph), making it faster than an airplane and almost three times faster than the world’s fastest train. Once implemented, Hyperloop will have a substantially positive impact on many different aspects of the future. A quick, safe and clean transportation system can help boost local economies, reduce a state’s carbon footprint, or offer relief from gridlock and parking congestion. The prototype design of the passenger cabin, a collaborative project developed by Designworks, Virgin Hyperloop One, and Transport Authority of Dubai, was first shown to the public at City Walk Dubai as part of United Arab Emirates Innovation Month 2018. 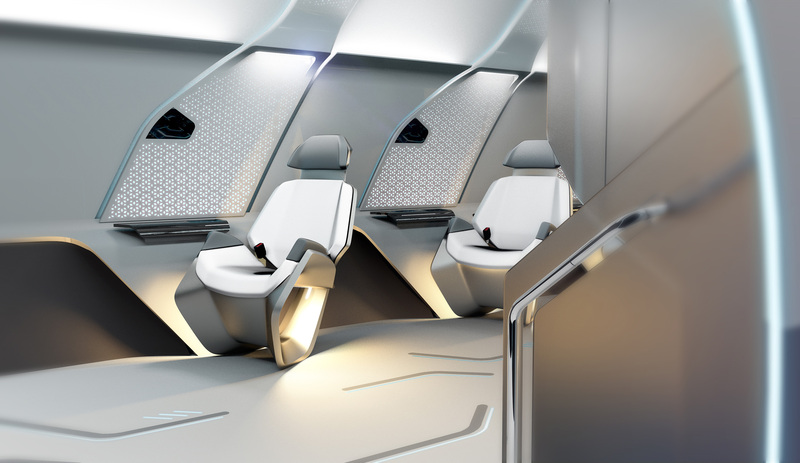 HOW DO YOU EVOKE A FEELING OF COMFORT, SAFETY AND LUXURY, WHILE MOVING IN A CAPSULE WITH NO WINDOWS, BELOW GROUND, AT AIRLINE SPEEDS? We envisioned the transportation of the future, as a place where passengers will feel safe, relaxed, comfortable and in control, despite the fact that there’s no driver and no possibility to leave their seats. We used multi-directional light to enhance the sense and quality of personal space. Importantly, we gave each passenger control over that space, enabling them to customise the travelling experience to their taste and mood. It was critical that the transportation of the future should not only look the part, but it should also reflect its context and environment. We further utilised light and texture to create subtle Arabic patterns that reflect the cultural legacy of the Middle East. In first class, adjustable seats feature touchscreens for personal settings for light brightness and color, heating and cooling, allowing passengers to shift the light from blue to pink to set the mood. Passengers can enjoy personalised entertainment through built-in displays.